If you’re approaching retirement, when you claim benefits is the most important financial decision you’ll likely make. The Social Security Claiming Guide sorts through all the options, spells out how much you can get, and answers frequently asked questions — all in a clear, easy-to-read, and colorful format. The companion brochure offers highlights of the Claiming Guide. 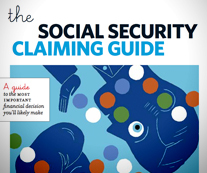 The Social Security Claiming Guide is available for $2.75 each (1-99 copies) or $2.50 each (100 or more copies), plus shipping. To place an order, click here. The Claiming Guide brochure is available for $1.75 each (1-99 copies) or $1.50 each (100 or more copies), plus shipping. To place an order, click here. For publications cited and information on topics not covered in the Claiming Guide, click here. © 2016, by Trustees of Boston College, Center for Retirement Research. All rights reserved.